The deadline for reserving exhibit space at the Digital Pathology Association’s (DPA) annual conference, Pathology Visions, is August 1, 2012. The DPA, a non-profit organization that promotes education and awareness of digital pathology applications, will be hosting Pathology Visions at the Baltimore Hilton in Baltimore, Maryland October 28-31, 2012. For the first time, Pathology Visions is offering an exhibitor discount for all Association/Affinity organizations. The Pathology Visions exhibit program furthers the education of attendees by providing an opportunity for on-site discussions and exchanges on the newest available technologies, as well as an area for exhibitors to present information on products or services pertinent to the attendees’ professional interests. There are five levels of exhibit support opportunities available which includes Diamond Supporter ($30,000), Platinum Supporter ($20,000), Gold Supporter ($10,000), Silver Supporter ($5,000), and Exhibit Booth Only ($4,000). 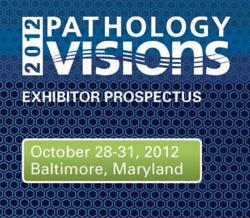 To reserve a spot as an exhibitor at Pathology Visions 2012, please click here. Once participating as an exhibitor has been confirmed, the company’s logo and a link to the company’s website will be featured on the 2012 Exhibitor & Supporter page. All booth assignments will be finalized August 3, 2012. For the first time, the DPA will offer Association/Affinity DPA Members an Exhibitor discount for Pathology Visions. Join the DPA today and receive a 10’x10’ exhibit space at Pathology Visions 2012 for $2,000 (a 50% discount). Annual membership is $500, click here for more Association/Affinity Organization member benefits. There are other support opportunities available in addition to exhibiting, including hosting a pre-conference workshop or purchasing advertising space in the Pathology Visions program, on the DPA website, or in the attendees’ hotel rooms. You can also support a meal during the conference, one of the Travel Awards, or an Internet Café. For more information regarding any of these support or exhibitor opportunities please visit our website. The Digital Pathology Association, located in Indianapolis, IN, was founded in 2009. Its mission is to facilitate education and awareness of digital pathology applications in healthcare and life sciences. Members will be encouraged to share best practices and promote the use of technology among colleagues in order to demonstrate efficiencies, awareness, and its ultimate benefits to patient care.